In this course, students will work closely with NYC-based artist Eiko Otake, of Eiko & Koma, in moving, creating, and sharing ideas. The class will start in the safety of a studio and move towards exposing one’s body (and mind) in public places. In learning movement exercises, students are encouraged to develop individual practice and perspectives. Through both preparing and experiencing durational performances, we will explore intimacy, anonymity, and hesitation. Together and individually, we will contemplate on what it is to perform. Through movement classes and discussions, the course makes active use of the fact that the instructor is a working movement artist (as Eiko & Koma) who grew up in postwar Japan. We will read literature and see artwork and films that connect to the idea of nakedness, a core theme of Eiko & Koma's work. What is it to be naked? This course combines movement study and an examination of Eiko & Koma's artistic process and influences as seen through their living installation, Naked, at the Baryshnikov Arts Center. 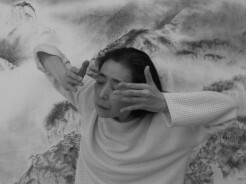 This course combines movement study and an examination of Eiko & Koma's artistic process and influences as seen through their living installation, Naked, at the Walker Art Center. This course combines the study of the atomic bombings, artistic representations of massive violence, and movement study. This course combines the "Delicious Movement Workshop" and the study of postwar Japanese arts with a focus on artists who assume the role of public intellectuals and who represent the memories of World War II. This course combines the "Delicious Movement Workshop" and the study of artistic representation of historical trauma and mass violence with the focus on atomic bomb literature. Eiko attended NYU gallatin graduate school from 2002-2006 graduating with MA thesis on atomic bomb literature. Part 3 is a translation of Kyoko Hayashi's "From Trinity to Trinity." It is published from Station Hill Press. Worked off from her's master thesis, in this essay Eiko describes "sustained mourning" as one of Eiko & Koma's continuous motifs.